Daily there seems to be news about the world being on the verge of a transport revolution. Electric cars will soon replace combustion engines, self-driving vehicles will be a part of everyday life, and new types of digital services will enable the flexible combination of various forms of transport. These technologies that are about to change the way we use transport are called smart transport or smart mobility. Some technologies used in smart mobility are related to vehicles themselves, such as the development of electric motors and self-driving cars. The other aspect of the phenomenon is digital services, which will change the way vehicles are used. A well-known example of this is Uber. The major revolution in transport will take place when the various transport methods and digital services are seamlessly combined. Only imagination sets the limits to the possible solutions that will be created already in the next few years and that will transform transport into a service. For example, by combining the use of shared self-driving electric cars and public transport, the need to have your own car standing in front of your house will be rendered unnecessary and simply a thing of the past. Smart mobility will inevitably change the economy as well. According to the estimate of the market research company ABI Research, the value of service business related to smart mobility alone will amount to as much as one trillion (1,000 billion) dollars by 2030. It is no wonder that all companies with transport-related operations are currently reviewing their business strategies, with large car manufacturers leading the pack. For Finland, smarter mobility is the opportunity of a lifetime. This is because the future change will combine several strengths that Finland and Finnish companies and society already have: a functioning transport infrastructure, strong energy sector, digital competence and flexible cooperation between authorities and the business sector. In addition, the new Transport Code is amongst the most advanced transport-related legislation in the world. Concrete business opportunities are already emerging at a constant rate. Terrafame is planning to start the production of nickel and cobalt chemicals used in the manufacture of batteries. New consumer services are combining the benefits of various transport modes into one monthly ticket. Robot cars are being tested on the roads in Helsinki. Vaasa is aspiring to be the location for the electric car manufacturer Tesla’s gigafactory and the related competence cluster. 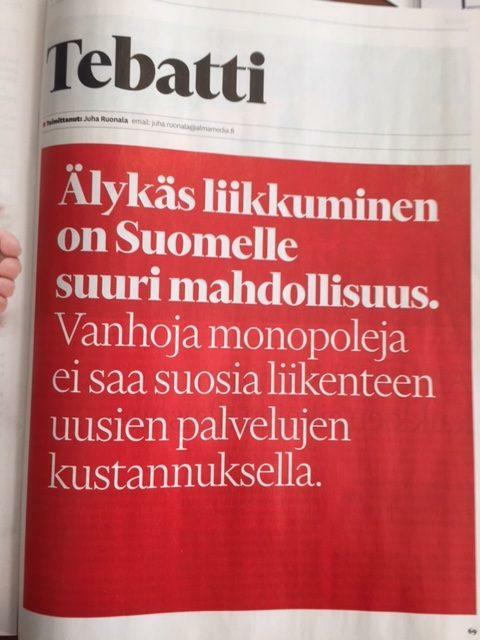 OP and LähiTapiola will start providing mobility services. International corporate giants, such as Toyota, Volkswagen and Denso will invest in innovations related to this field in Finland. We have the opportunity to make Finland the pioneer in smart mobility while utilising the same development to significantly increase employment and economic growth. However, this cannot be done without increasing the flexibility related to the possibilities of experimenting with new technologies and services. For example, favoring the traditional monopolies at the cost of new transport services will not promote the possibilities to create genuinely new innovations. Finland should now take action in order to ensure that we can develop into a forerunner country in smart mobility. In the next few years already, the changes in transport will generate not only questions related to technology but also challenges related to community and town planning, responsibilities, the opening of markets and intellectual property rights. These changes should be taken into account already in the Transport Code that is being prepared. It should be kept in mind that smart mobility is also about societal changes. New services can improve the quality of life in congested big cities and in remote districts in which public transport is no longer available. Efficient use of resources and reducing emissions will also play a key role in the fight against climate change. For this reason, Finland should invest in cooperation that extends beyond the boundaries of companies, industries and public and private sectors by enabling even bold experiments. This would facilitate the emergence of new transport innovations in Finland instead of only adopting solutions that are created in international markets and utilised by others. If our focus is short-sighted and about protecting what exists now— often monopoly type public transport operations at the national or town level— we will miss the opportunity to create new services. Finland is a country with a high level of trust and technological leadership. Compared to countries in which citizens and companies do not trust each other or the authorities, Finland is a place where it is easier to implement services such as those related to the sharing economy. This trust and desire to experiment are now the keys to the once-in-a-lifetime opportunity to utilise Finnish work, improve the everyday life of citizens and reduce the environmental burden.